Last Sunday didn't turn out as wished for the Tipperary minor hurling panel as they failed to make it through to the All-Ireland Final losing out by just 2 points to Kilkenny 1-15 to 2-10 in the Electric Ireland All-Ireland Minor Hurling Semi-Final in Croke Park. Unfortunately a below par first half performance seemed to be their undoing and despite outscoring their opponents with a much improved effort in the second half with both Tipperary goals came in that half courtesy of Mikey O’Shea (Mullinahone). However, it wasn't enough to see them through as they bow out after an otherwise hugely successful campaign with the highlight being crowned Munster champions on July 1st. We commiserate with the panel and management team of Tommy Dunne, Paul Collins, Ger Ryan and Tony Shelly and thank them for and their backroom team for all the tremendous work put in this year. Due to the All-Ireland senior hurling semi-final replay going ahead next Sunday, Tipperary will now play Galway in the Bord Gais Energy All-Ireland Under 21 Hurling Championship Semi-Final in the Gaelic Grounds on Wednesday August 8th with a 7:30pm throw-in time. Extra time will be played if necessary and the referee will be Sean Cleere (Kilkenny). Cork will play Wexford in the other semi-final at 4pm in Nowlan Park this Saturday afternoon. Best wishes to our referees in action this weekend, where first up Derek O'Mahoney (Ardfinnan) takes charge of the All-Ireland Senior Football Quarter-Final Group 1 Phase 3 between Kerry and Kildare on Saturday next in the Fitzgerald Stadium, Killarney. Then on Sunday in Semple Stadium, Fergal Horgan (Knockavilla-Donaskeigh Kickhams) is in the middle as he holds the whistle for the next gripping instalment in the hurling calendar as Clare and Galway square up for their All-Ireland Senior Hurling Championship Semi-Final replay at 2pm. The Tipperary Water Hurling League Division 1 Final 'Johnny Ryan Cup' between Borris-Ileigh and Nenagh Éire Óg throws in this Tuesday night, July 31st in Nenagh with a 7:30pm start. Also, on tonight is the Division 5 hurling league final between Grangemockler-Ballyneale and Kilsheelan-Kilcash which will be played in Davin Park also at 7:30pm. In the Tipperary Water County Football League Division 2 final, Cahir and Rockwell Rovers meet in Bansha also this Tuesday, July 31st at 7:45pm. Next Tuesday, August 7th, in the Tipperary Water County Hurling League Division 6 Final, Ballingarry will play Newcastle in Monroe with a 7:30pm throw-in. In the two Tipperary Water County Football League finals played in the past week, Killenaule defeated St. Patrick's 4-9 to 1-7 in the Division 3 Final; while in the Division 1 equivalent Moyle Rovers got the better of Clonmel Commercials 1-14 to 0-14. At divisional level the Mid Centenary Mid Senior hurling Championship semi-finals Thurles Sarsfields defeated JK Brackens 5-26 to 2-16 while Loughmore-Castleiney saw off the Holycross-Ballycahill challenge 1-30 to 0-10. In the North division it was much closer in the Hibernian Inn semi-finals last Friday night. Kilruane MacDonaghs with a final flourish eventually got passed Toomevara 1-18 to 1-13 in Dolla, while in Templederry, in what was probably the game of the week Kiladangan and Nenagh Éire Óg couldn't be separated as the sides remained deadlocked 2-22 apiece after extra time. We send best wishes to Billy McCarthy (Thurles Sarsfields) for a full and speedy recovery following his very serious knee injury in the Mid semi-final last week. Best wishes to the Tipperary senior camogie team who play Waterford in the Liberty Insurance Senior Championship All-Ireland Quarter Final this Saturday, August 4th in Páirc Uí Chaoimh at 5:30pm. Extra time will be played if required. The Team Tipperary GAA Race Day at the Galway Races was held on Monday, July 30th and once again proved to be another outstanding success. The driving force behind this venture is County Secretary Tim Floyd and we owe him huge thanks for the relaxed and smooth running of the event. With 36 tables seated, guests were entertained with interviews revealing wonderful insights of the hurling calendar in particular such have been the nature of the games this season. 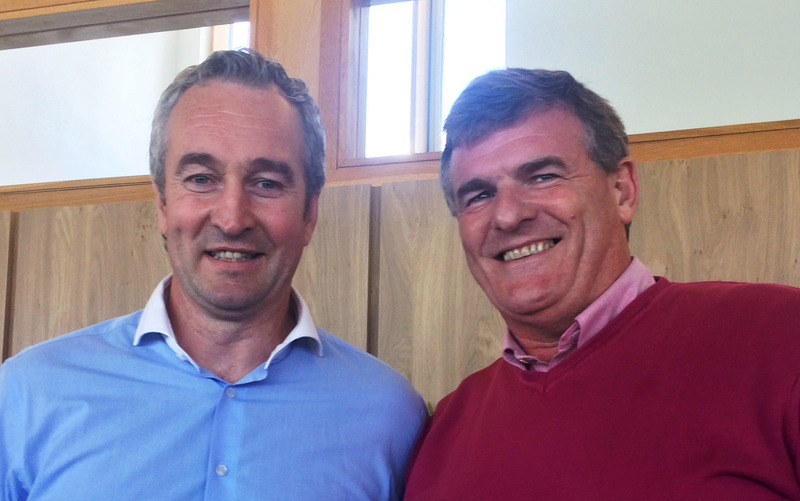 Former Sunday Game editor, Paul Byrnes expertly conducted these interviews as he put probing and insightful questions to Liam Sheedy and Cyril Farrell following the unbelievable semi-finals witnessed last weekend. Later he interviewed both Tipperary senior managers Mick Ryan and Liam Kearns (right) and enquired on their perspective of the events this year and an analysis of their own respective campaigns this year. The fundraising auction proved to be a highlight of the night with former Tipperary Football Committee chairman, Joe Hannigan (left) ruling the roost in this one. Joe was outstanding at the podium as he cajoled guests in breath taking fashion culminating in a standing ovation for the highest bidder who secured 4 senior All-Ireland hurling tickets all in aid of a wonderful Team Tipperary GAA fundraiser. The M. Donnelly GAA All-Ireland Poc Fada Finals take place this Saturday, August 4th on the Cooley Mountains and we send best wishes to Kyle Shelly (Moycarkey-Borris) in the U16 competition and to Mike Flannery (Newport) in the senior competition both representing Tipperary and Munster in the event on Saturday. August 4, 1918 will be remembered as one of the most remarkable and significant days in the history of the GAA. Known as Gaelic Sunday – it was a day when the clubs of the GAA stood against the British Empire and triumphed in a peaceful protest. In 1918 the British authorities in Ireland were trying to impose conscription to supplement the war effort but there was massive opposition to this. British authorities blamed the GAA in part for this opposition and hit back by preventing matches from taking place, stopping the provision of special trains to carry supporters to matches and insisting that a written permit was required granting permission for any GAA match to take place. In response the GAA declared a national day of defiance and called on GAA clubs all over Ireland to refuse to seek a permit and instead organise club activity for 3pm on Sunday, August 4. The result was that an estimated 54,000 took part with more than 100,000 watching and such was the success of the initiative that the attempt to impose a requirement for a license to play Gaelic games was scrapped. This year marks the centenary of that courageous act and we want GAA Clubs all over Ireland to show a similar level of pride in their club, their games and the area they represent. Across the weekend of August 4 & 5 we want clubs to hold their own club events as part of these commemorations. It could be an internal club tournament, family day or club history exhibit. What matters is that 100 years on we still have games and GAA clubs we are proud of. A century later the relevance of Gaelic Sunday remains an interesting topic. A defiant statement was made with the GAA beginning to stitch itself into the fabric of Irish society. So from a Tipperary perspective hopefully our clubs can play an active role this weekend to commemorate Gaelic Sunday and as Cian writes keep alive "a similar level of pride in their club, their games and the area they represent".